Dr. Coopwood was born and raised in Lockhart Texas and is a 1956 graduate of Lockhart High School . Dr. Coopwood attended UT Austin from 1956-1959 for premed receiving a BA in Plan 2. 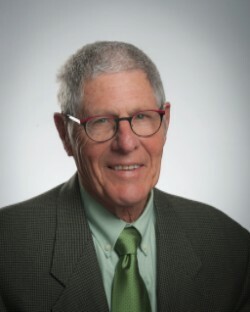 After graduating from Baylor College of Medicine in 1963 and completing an internship, Dr. Coopwood spent 2 years in the US Air Force before returning to Baylor to complete a General Surgery residency in 1970. Dr. Coopwood has been active in the community serving on the Northwest Austin Civic Association Board as Vice President from 2009-2013. Awards: Physician of the Year at Brackenridge (1988) and the Travis County Medical Society (2004) Named by Austin Business Journal as a Healthcare Hero (2011). After retirement he has held several different community Board positions. He served as a Member of the Board of Managers of Central Health from 2004-2015, serving as Board Chair for 3 years and serving on the Mayor’s Taskforce on Aging and the Commission for Aging for one year.